Between the years 2003 and 2011, the High Accuracy Radial velocity Planet Searcher – better known as HARPS – made more than a thousand observations of nearby star, Beta Pictoris. On board the ESO 3.6-metre telescope at the La Silla Observatory in Chile, the sensitive instrument normally combs the sky nightly in search of exoplanets, but lately it has contributed to another astounding discovery… exocomets! Located about 63 light-years from the Sun, Beta Pictoris is a youthful star, estimated to be only around 20 million years old. Keeping it company in space is a vast disc of material. This swarm of gas and dust is the beginnings of an active planetary system and was likely created by the destruction of comets and collisions of rocky bodies like asteroids. Now a French team using HARPS has been able to create the most complete catalog of comets to date from this system. Researchers have found no less than five hundred comets belonging to Beta Pictoris and they divide in two unique branches of exocomets. Split into both old and new, these two active flows behave much like our own cometary groups… They have either made many trips around the parent star or are the product of a recent breakup of one or more objects. Just like discovering planets through the transit method, astronomers believe exocomets can cause a disturbance in the amount of light we can see from a given star. When these icy travelers exhaust themselves, their gas and dust tails could absorb a portion of the star light passing through them. For nearly three decades scientists had been aware of minute changes in the light from Beta Pictoris, but attributing it to comets was next to impossible to prove. Their tiny light was simply overpowered by the light of the star and could not be imaged from Earth. Using more than a thousand observations taken by this sensitive equipment, astronomers chose a sample of 493 exocomets unrelated to each other, but sharing in the Beta Pictoris system. Of these, some were dutifully followed for hours at several different times. The size and speed of the gas clouds produced were carefully measured. Researchers were even able to document the orbital properties of some of these exocomets – the size and shape of their passage paths in relation to the parent star allowing scientists to infer their distances. Knowing that comets exist around other stars is very exciting – and knowing that solar systems around other stars work much like our own is downright rewarding. Through this study, we’re able to take a unique look at what might be several hundreds of exocomets connected to a solitary exo-planet system. What the research has revealed is two distinct branches of the comet family tree. One of these is old comets – their orbit dictated by a single, massive planet. The other half of the family fork belongs to comets that might have arisen from the destruction of a larger object. The older group behaves in a predictable manner. These exocomets have differing orbital patterns, and their gas and dust production is greatly reduced. If they follow the same rules as the ones in our solar system, it’s typical behavior for a comet which has exhausted its volatiles during multiple trips around the parent star and is also being controlled by the system’s massive planet. This is exciting because it confirms the planet’s presence and distance! A Saturn-mass planet might be lurking in the debris surrounding Beta Pictoris, new measurements of a debris field around the star shown. If this could be proven, this would be the second planet found around that star. The planet would be sheparding a giant swarm of comets (some in front and some trailing behind the planet) that are smacking into each other as often as every five minutes, new observations with the Atacama Large Millimeter/submillimeter Array (ALMA) show. This is the leading explanation for a cloud of carbon monoxide gas visible in the array. ALMA captured millimeter-sized light from carbon monoxide and dust around Beta Pictoris, which is about 63 light-years from Earth (relatively close to our planet). The gas seems to be most prevalent in an area about 8 billion miles (13 kilometers) from the star — the equivalent distance of three times the length of Neptune’s location from the sun. The carbon monoxide cloud itself makes up about one-sixth the mass of Earth’s oceans. Ultraviolet light from the star should be breaking up the carbon monoxide molecules within 100 years, so the fact there is so much gas indicates something must be replenishing it, the researchers noted. Their models showed that the comets would need to be destroyed every five minutes for this to happen (unless we are looking at the star at an unusual time). While the researchers say they need more study to see how the gas is concentrated, their hypothesis is there is two clumps of gas and it is due to a big planet behaving similarly to what Jupiter does in our solar system. Thousands of asteroids follow behind and fly in front of Jupiter due to the planet’s massive gravity. In this more distant system, it’s possible that a gas giant planet would be doing the same thing with comets. If the gas turns out to be in just one clump, however, another scenario would suggest two Mars-sized planets (icy ones) smashing into each other about half a million years ago. This “would account for the comet swarm, with frequent ongoing collisions among the fragments gradually releasing carbon monoxide gas,” NASA stated. The research was published yesterday (March 6) in the journal Science and is led by Bill Dent, a researcher at the Joint ALMA Office in Chile. You can read more information in press releases from NASA, the National Radio Astronomy Observatory and European Southern Observatory. The world’s newest and most powerful exoplanet imaging instrument, the recently-installed Gemini Planet Imager (GPI) on the 8-meter Gemini South telescope, has captured its first-light infrared image of an exoplanet: Beta Pictoris b, which orbits the star Beta Pictoris, the second-brightest star in the southern constellation Pictor. The planet is pretty obvious in the image above as a bright clump of pixels just to the lower right of the star in the middle (which is physically covered by a small opaque disk to block glare.) But that cluster of pixels is really a distant planet 63 light-years away and several times more massive — as well as 60% larger — than Jupiter! While many exoplanets have been discovered and confirmed over the past couple of decades using various techniques, very few have actually been directly imaged. It’s extremely difficult to resolve the faint glow of a planet’s reflected light from within the brilliant glare of its star — but GPI was designed to do just that. And GPI doesn’t just image distant Jupiter-sized exoplanets; it images them quickly. Despite its large size, Beta Pictoris b is a very young planet — estimated to be less than 10 million years old (the star itself is only about 12 million.) Its presence is a testament to the ability of large planets to form rapidly and soon around newly-formed stars. The left image shows shows normal light, including both the dust ring and the residual light from the central star scattered by turbulence in Earth’s atmosphere. The right image shows only polarized light. Leftover starlight is unpolarized and hence removed. The light from the back edge of the disk (to the right of the star) is strongly polarized as it reflects towards Earth, and thus it appears brighter than the forward-facing edge. It’s thought that the reflective ring could be from a belt of asteroids or comets orbiting HR4796A, and possibly shaped (or “shepherded,” like the rings of Saturn) by as-yet unseen planets. GPI’s advanced capabilities allowed for the full circumference of the ring to be imaged. GPI’s success in imaging previously-known systems like Beta Pictoris and HR4796A can only indicate many more exciting exoplanet discoveries to come. This year the GPI team will begin a large-scale survey, looking at 600 young stars to see what giant planets may be orbiting them. The observations above were conducted last November during an “extremely trouble-free debut.” The Gemini South telescope is located near the summit of Cerro Pachon in central Chile, at an altitude of 2,722 meters. The planetary world keeps getting stranger. Scientists have found free-floating planets — drifting alone, away from stars — before. But the “newborn” PSO J318.5-22 (only 12 million years old) shows properties similar to other young planets around young stars, even though there is no star nearby the planet. The planet is about 80 light-years from Earth, which is quite close, and is part of a star group named after Beta Pictoris that also came together about 12 million years ago. There is a planet in orbit around Beta Pictoris itself, but PSO J318.5-22 has a lower mass and likely had a different formation scenario, the researchers said. Astronomers uncovered the planet, which is six times the mass of Jupiter, while looking for brown dwarfs or “failed stars.” PSO J318.5-22’s ultra-red color stood apart from the other objects in the survey, astronomers said. The free-floating planet was identified in the Pan-STARRS 1 wide-field survey telescope in Maui. Follow-up observations were performed with several other Hawaii-based telescopes, including the NASA Infrared Telescope Facility, the Gemini North Telescope, and the Canada-France-Hawaii Telescope. The discovery will soon be detailed in Astrophysical Letters, but for now you can read the prepublished verison on Arxiv. Amateur astronomer Rolf Wahl Olsen from New Zealand shared an image with Universe Today, and it is perhaps the first image of another solar system taken by an amateur. 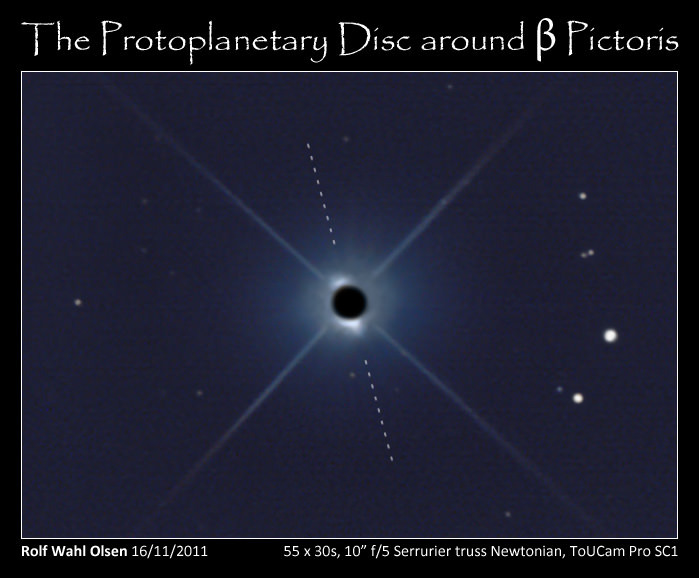 The image above is Olsen’s image of the protoplanetary disc around Beta Pictoris. Olsen said he has been fascinated by professional images of Beta Pictoris since seeing the first one in taken in 1984. Beta Pictoris and the protoplanetary disc of debris and dust that is orbiting the star is 63.4 light years away from Earth. This is a very young system thought to be only around 12 million years old and astronomers think this is essentially how our own Solar System must have formed some 4.5 billion years ago. The disc is seen edge-on from our perspective and appears in professional images as thin wedges or lines protruding radially from the central star in opposite directions. “The main difficulty in imaging this system is the overwhelming glare from Beta Pictoris itself which completely drowns out the dust disc that is circling very close to the star,” Olsen said. Images of the disc taken by the Hubble Space Telescope, and from big observatories, are usually made by physically blocking out the glare of Beta Pictoris itself within the optical path. He followed the technique described in the paper, which basically consists of imaging Beta and then taking another image of a similar reference star under the same conditions. The two images are subtracted from each other to eliminate the stellar glare, and the dust disc should then hopefully reveal itself. The next step was to capture a similar image of a reference star under the same conditions. Olsen did as the paper suggested and used Alpha Pictoris, a star that is of nearly the same spectral type (A7IV compared to Beta’s A6V) and is also close enough to Beta in the sky so that the change in telescope orientation should not affect the diffraction pattern. However, since the two stars have different magnitudes he needed to calculate how long to expose Alpha for in order to get a similar image which he could subtract from the Beta image. Due to the logarithmic nature of the magnitude scale we know that a difference of 1 magnitude equals a brightness ratio of 2.512. Therefore 2.512 to the power of the numerical magnitude difference then equals the variation in brightness. Olsen said he was disappointed with the raw “Difference” image so to produce a more natural looking result, he took the original stacked Beta image and then blended in the central parts from the Difference image that showed the dust disc. “I decided to also keep the black spot of the central glare from the Difference image since the contrast with the protruding disc seems better this way,” Olsen said. What resulted is what is thought to be the first amateur image of another solar system. Olsen is encouraging others amateur astrophotographers to try this, and see if they can do even better. If any other amateur astronomers have attempted to image a disk around another star, we’d love to hear about it and see the results. For the first time, astronomers have been able to directly follow the motion of an exoplanet as it moves from one side of its host star to the other. The planet has the smallest orbit so far of all directly imaged exoplanets, lying almost as close to its parent star as Saturn is to the Sun. The star, beta Pictoris is only 12 million years old, and so this exoplanet confirms that gas giant planets can form very rapidly—in only a few million years—within such circumstellar disks, and experts say that this discovery validates the theory that these unique, gaseous disk structures can be used as a sort of “fingerprint” to characterize their embedded planets. Beta Pictoris is 75% more massive than our Sun, and is located about 60 light-years away towards the constellation of Pictor (the Painter). This is one of the best-known examples of a star surrounded by a dusty debris disc. Earlier observations showed a warp of the disc, a secondary inclined disc and comets falling onto the star. This exoplanet, dubbed Beta Pictoris b, was thought to have been spotted first in 2003, and then was first imaged back in 2008. But the astronomer couldn’t rule out definitively that the possible planet wasn’t just a foreground or background object. These new observations confirm that, indeed, the object is a gas giant planet orbiting the star. Other recent observations have shown that discs around young stars disperse within a few million years, and that giant planet formation must occur faster than previously thought. Only about ten exoplanets have been imaged, Beta Pictoris b, has the smallest orbit known so far. It is located at a distance between 8 and 15 times the Earth-Sun separation — or 8-15 Astronomical Units — which is about the distance of Saturn from the Sun. “The short period of the planet will allow us to record the full orbit within maybe 15-20 years, and further studies of Beta Pictoris b will provide invaluable insights into the physics and chemistry of a young giant planet’s atmosphere,” said student researcher Mickael Bonnefoy. The planet has a mass about nine times that of Jupiter, and the right mass and location to explain the observed warp in the inner parts of the disc. This discovery therefore bears some similarity to the prediction of the existence of Neptune by astronomers Adams and Le Verrier in the 19th century, based on observations of the orbit of Uranus. The team used the NAOS-CONICA instrument mounted on one of the 8.2-metre Unit Telescopes of ESO’s Very Large Telescope (VLT). These most recent observations, taken during autumn 2009, revealed the object on the other side of the disc from where it was seen in 2008, and after a period of hiding either behind or in front of the star (in which case it is hidden in the glare of the star). This confirmed that the source indeed was an exoplanet and that it was orbiting its host star. It also provided insights into the size of its orbit around the star. “Together with the planets found around the young, massive stars Fomalhaut and HR8799, the existence of Beta Pictoris b suggests that super-Jupiters could be frequent byproducts of planet formation around more massive stars,” said team member Gael Chauvin.